Do you know how digital learning may impact your career development? 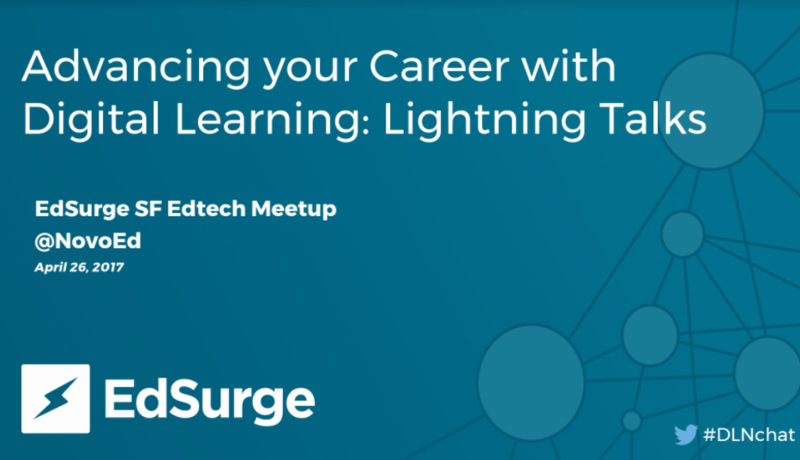 On April 26, EdSurge, an educational technology news and information hub, hosted a meetup that addressed how digital learning can contribute to career development. The attendees include instructional designers, education experts, teachers, employees at edtech companies as well as investors. There was a buzz of energy at this digital learning event among the attendees as people were engaged in discussions before the main presentations started. 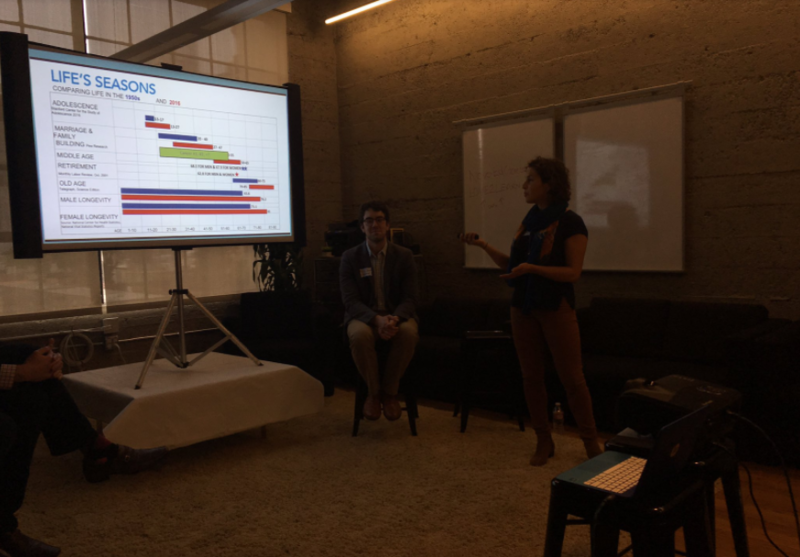 The event featured five guest speakers: Gabrielle Santa-Donato from Stanford University, Reilly Davis from PeopleGrove, Greg Bybee from NovoEd, David Good from IDEO U, and Sonia Kim from Udemy. The event was co-hosted by NovoEd. Gabrielle Santa-Donato, who is a lecturer and fellow in the Life Design Lab at Stanford, spoke about the importance of networking in job hunting. She explained that 80% of opportunities were never listed publicly, but were available through conversations with connections. In order to get in the conversation, she introduced a design thinking approach called inspirational interviews: hearing stories from other people and gathering useful career development information. She encouraged the audience to start inviting people for coffee chat, which was a great way of having an inspirational interview. Reilly Davis, the co-founder of PeopleGrove, started his talk by addressing the current demand of students in higher education: they want better job outcomes, and they want their learning experience to be more social and experiential. He believed that alumni mentors could play a crucial role in bridging the gap between college education and career development. By connecting alumni mentors and student mentees, alumni were more willing to providing resource back to their alma mater, and the students were more prepared for starting their career. 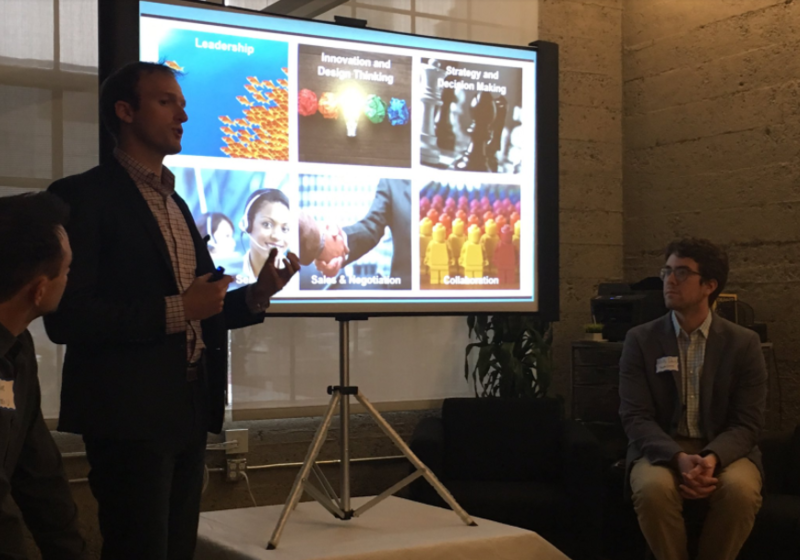 Greg Bybee, VP at NovoEd, talked about the importance of soft skills (e.g. empathy) in the work environment today. He quoted from Bruce Tulgan’ book Bridging the Soft Skills Gap that 90% of unsuccessful hires fail due to (lack of) soft skills. Greg pointed out that the best way to develop soft skills was through collaborative and experiential learning. He introduced many examples of how NovoEd helped corporates and institutions recreate their interactive, team-based learning experience online. David Good, Product Lead at IDEO U, discussed how to use a design thinking approach to building online courses. Essentially, the idea is ideating, building prototype, and refining the prototype by more ideation. For online courses, David suggested that people learn from the best, so they would get inspired and develop better ideas. He also suggested that people incorporate different perspectives and focus on the learning processes so that people would get more feedback. Finally, he talked about the importance of actually doing things. Although the courses might take place online, he believed that learners should practice offline to get the best learning results. Sonia Kim, an instructional designer from Udemy, addressed on the impact of online learning on instructors. She introduced three of Udemy’s online instructors, who had different backgrounds and experience levels with teaching experience. With help from instructional designers at Udemy, they all successfully developed their online courses and have successful offerings on Udemy content network. This digital learning event was a huge success. The audience was clearly impressed by the presentations and the relevant topics of design thinking, creative instructional programs, and online peer learning. The conversations continued among the speakers and attendees after the panel, with a lively exchange of ideas and discussion.